TBM 900 v1.1.4 Free Update! HotStart TBM 900 v1.1.4 Update! 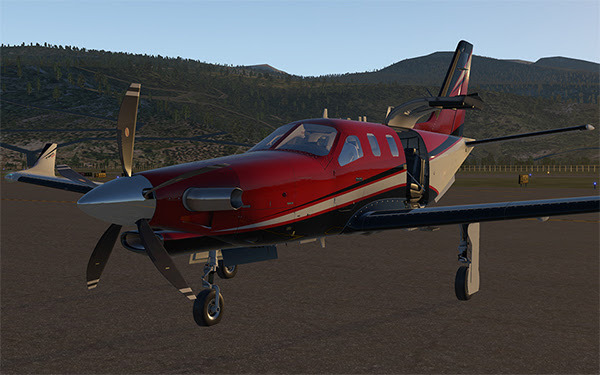 X-Aviation and HotStart are proud to announce the release of the TBM 900 v1.1.4 update. Deepened manipulators and fixed cabin pressure manipulator. Fuel indicator lines were misrendered and showing too low to the actual tank state. Fuel gauge lines should use a gradianted pattern, instead of a flat color. Added GPU exhaust particle effect. Added remap from X-Plane's TOGA_power to trigger our takeoff guidance and kill X-Plane's tendency to give full power as if we had A/THR. Added propeller tip vortices at high power and high humidity. Added FUEL SEL AUTO checklist item into the engine start checklist. Removed superflous AUX BP AUTO checklist item from the after start checklist. Implemented new airspeed and altitude tapes with better annunciator mode management. Changed G1000 fuel units to gallons - should now show correct units in FPL fuel predictions. Fixed broken AP/TRIMS disconnect and AP off buttons in XP11.30. Switched to using tags for version IDs for more readable version strings. Use XPLMNavRef to avoid airports with inconsistent ICAOs in the X-Plane nav database confusing us. Implemented maximum climb torque and optimum cruise torque marks on the torque gauge. Added directly settable datarefs for all switches, so integration with external controllers and cockpits is simpler. Added direct set commands for all toggle controls to simplify integration for cockpit builders. Fixed broken alternate static port manipulator. Implemented DIMMER light switch on the overhead. Fixed missing approach pathways on ILS approaches. Adjusted rear seats so armrests are touching. Adjusted manipulators to reflect armrest changes. Fixed Nav/Strobe lights to be closer to the real thing. Chocks were sometimes misaligned. Added a vertical deflection dataref to align chocks to landing gear. EDM should be using the GASC-computed cabin altitude, not true cabin altitude. Bad fx_lin_multi field array could cause an assertion failure. Obstacle database was broken because FAA had switched to HTTPs and we weren't expecting that. XP11.30 reordered how the airport loading message is sent at start, leading to a double aircraft system init/deinit on aircraft reload via the Developer menu. Indicated airspeed computation was affected by pitot covers, yielding broken behavior for engine driftdown in windy conditions. Documented all custom switch datarefs + commands for cockpit builders. Can be found under Documentation/DataRefs+Commands.txt. Fixed TerraMax license conflict causing TerraMax to sometimes deactivate momentarily. Fixed misaligned LOC with runway centerline. Added manual vertical realignment of GS transmitters with actual sim terrain elevation.